Horrible Harry is at it again in a rollicking story of Field Day adventures, mishaps...and revenge! It’s one of the best days at South School: Field Day! That means bean bag tosses, relay races, and tug of war. When Mr. Deltoid announces students will pair up to compete for a mystery prize, Harry and Doug are determined to win. But at what cost? Harry's sneaky tactics leave Sid and Mary grumbling. They even claim he’s cheating. Harry insists he's playing fair and square. Doug doesn’t know what to think! 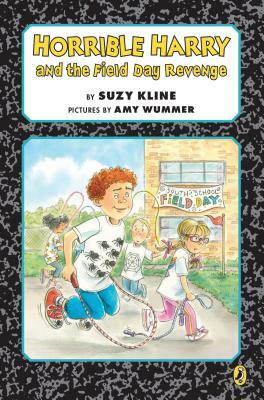 He must prove his best friend is innocent before his classmates seek Field Day revenge. Can they win and play by the rules, or will the highlight of the year be a horrible disaster? Suzy Kline has written thirty-five previous Horrible Harry books. She is also the author of numerous popular children's books, including the Orp books and the Herbie Jones series. She taught elementary school for twenty-seven years and now does scores of school visits in addition to her writing. You can visit her at www.suzykline.com. Amy Wummer has illustrated many children's books, including the Marvin Redpost series by Louis Sachar and a number of previous books in the Horrible Harry series. She and her husband live in Reading, Pennsylvania, with their three children.